Exceptional!. This is a beautiful 168 piece George V Boxed Canteen of Cutlery. 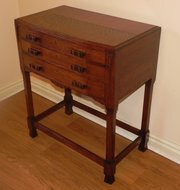 With over 5kg of Sterling, it is a top quality service in superb order, boxed in nicely sized oak side table with 3 drawers. All of the pieces are by Fleming & Sons of Sheffield and assayed in 1938. This has been in the same family since 1938 and is totally new to the market. A 12 place setting (see full details below). There are Silver Forks, with Knives & Forks of MOP and Firth Stainless, carefully crafted for beauty, practicality and longevity. This is a wonderful dining set that will surely prove a fabulous gift or family investment piece. TOP DRAWER 12 Silver Forks (822g) 12 Stainless Table Knives 12 Stainless Dessert Knives 12 Silver Dessert Forks (600g) 3pc Carving Set - Knife, Fork & Sharpening Steel MIDDLE DRAWER 12 Mother of Pearl Handle EPNS Fruit Forks 12 Mother of Pearl Handle EPNS Fruit Knives 12 Silver Fruit Spoons (336g) 12 Stainless EPNS Fruit Knives 12 Silver Fish Knives (540g) 12 Silver Fish Forks (432g) BOTTOM DRAWER 12 Silver Teaspoons (288g) 12 Silver Dessert Spoon (646g) 12 Silver Soup Spoons (800g) 2 Silver Sauce Ladles (164g) 1 Silver Soup Ladle (180g) 4 Silver Table Spoons (316g) 2 Silver plated Cake Knife & Fork. Lavender Hill Antiques, North west antique dealers. Antique Furniture, Vintage Vanity, Powder Compacts, Perfume Bottles, Vintage Jewellery, Silver, Collectables.